Updated Giveaway Sat. Nov 12. Barrie is willing to giveaway one more autographed and personalized copy of I So Don't Do Mysteries. This giveaway will be open to all who leave a comment between now and Monday Nov 14. If know a young reader who that would enjoy this gift delurk and enter. Leave their first name and age. Plus your email. The winner will be announced on Tuesday. Barrie Summy is the author of two fun tween mysteries published by Delacorte Press, A Random House imprint. I So Don't Do Mysteries and as of this week I So Don't Do Spooky. My review. I am a big mystery fan and I am loving this new series. So, I happy to be able to ask the author a few questions. Hello Barrie. Congratulations, on the Cyblis nomination for your first book and the release of your second book I So Don't Do spooky. Barrie, can you tell us a little about yourself? Say that in French. Is there such a thing as unveiled chameleons? Have you sold any of your chameleon eggs to the pet store yet? Ha! to questions 1 and 2 We'll be selling one-month old veileds to the pet store. I'm sure Child #2 will use his chameleon money to buy his mother an uber expensive birthday gift! I deserved that first, Ha, I was trying to be funny. 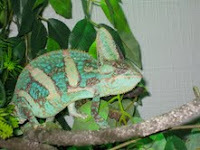 But, the second one is uncalled for, since I know nothing about chameleons. Barrie, be my google search tell me three things about chameleons? I'll try to limit myself to three things! We've become such aficiandos around here. Veiled chameleons are Old World chameleons. Their eyes move independently. They rock back and forth slowly like a leaf in the wind when stalking prey (like a cricket). Their sticky tongue can be 1 1/2 times as long as their body. They're extremely cute. Ooops. Went over three things! How long did it take to write and sell your first book? I think about eight or nine years. Which somehow sounds a lot longer than it felt! I guess because I'd take it seriously for a while, then back off depending on what else was going on in life, then jump back into writing. But eight or nine years? I never thought it would take that long! Your first book has been out over a year now. What have you learned about the publishing industry in that time? It's more of a juggling act than I expected. There's writing enough each day to keep up with deadlines. Then there's promotion (school visits, author panels, etc.). Then there's coming up with ideas for the next book. Busy, but fun. When did you and your protagonist, Sherry Holmes Baldwin first get acquainted? Right after Simon and Schuster rejected the mystery for Nancy Drew! I moped around for a few days, then decided they were probably right; it wasn't the right case for Nancy. I started looking for a new sleuth. And Sherry stepped up to the plate! If Nancy Drew was a real person I think (or hope) she would say, "I am tired. I don't want any new cases." Can you tell us a little about the series? At this point, the series involves four books: I So Don't Do Mysteries (Dec. 2008), I So Don't Do Spooky (Dec. 2009), I So Don't Do Makeup (May 2010) and I So Don't Do Famous (May 2011). The core characters remain the same for each book, such as Sherry and her ghost mother. Some other repeat characters are Junie, Sherry's BFF; Josh, Sherry's boyfriend; Amber, Junie's cousin; The Ruler, Sherry's stepmother; and Sherry's grandfather who has been reincarnated as a wren. Then, there are brand new characters who just show up for one mystery. For example, in I So Don't Do Spooky, there's a 13-year-old psychic, a ghost hunter, and some intense robotics' students. Barrie, you're leaving out all the good stuff. Like how Sherry's ghost mom and wren grandfather are members of the Academy of Spirits. In I So Don't Do Spooky with Sherry's help they must figure out who's stalking Sherry's Stepmother, the Ruler. Sherry's mom is also competing in the ghostlympics. The robotics students were very intense with the right amount of creepy. So the 13 yr old psychic and the ghost hunter, won't be back. If that's what your saying, I am kind of sad right now. It makes me kind of sad too. Hmmm....I wonder if there's a way to bring back the 13-year-old psychic in I So Don't Do Famous??? OR maybe she could have her own series! Yes, please bring the psychic back. And of course I am pleading, not for myself but for the children. Each book has a character named after one of my kids. Very cool. Did your kids try to have a say in the personalities of their character namesakes. Well, no, not really. :) In fact, Child #3 (or at least his namesake) is a suspect in I So Don't Do Makeup. He's very happy about it, though, because his character is... muscular! Authors seem to put girls in boxes. Forcing young girls to choose. Girls who like make-up, clothes and accessorizing aren't suppose to solve mysteries. With Sherry, girls don't have to choose, she's a fashion conscious sleuth. Was this character balance intentional? Yes. I wanted Sherry to pretty much be the girl next door. She doesn't have it all together yet; she shares a lot of the same interests with real tweens; she deals with typical tween problems (family, girlfriend, boy issues). But, in addition to all this, she solves mysteries. There were moments when I cringed for Sherry and stepmom's safety as I wondered who the stalker was. Barrie, thank you for keeping this novel in the now and not having any 80's or 90's references. I think keeping it very contemporary worked well for Sherry and her friends. Glad it worked or you too! A few chapters into I So Don't Do Spooky I noticed how much more you were giving readers. The second book was stronger than the first. Barrie, was it easier to write the first or second book ? How would you compare the two? What can we expect in I So Don't do Make-Up? Hands down, writing I So Don't Do Spooky was easier and more fun. It was like getting together with old friends. And because Sherry grows up a little in each book, I was curious to see how she'd handle things. Plus, I'd already done a book with Editor Wendy, so I knew what to expect there. Same thing with I So Don't Do Makeup. I really enjoyed writing it. And, without giving too much away, the darkest moment in Makeup involves....a dumpster! Don't worry, Barrie you didn't give too much (anything) away. What if I said I was Oprah could I get more out of you then dumpster? Uh, if you were Oprah, you could probably get me to give it all away. Including my first born! Who are some of your favorite mystery authors? What are a few of your favorite books this year? Barrie, thanks for answering these questions in your... Well I don't know where you are but still thank you. I wish you much success with the Sherry Holmes Baldwin, series. I hopes its at least half as big as I think it should be. Thank you! It was a pleasure visiting you! Hi! Just stopping by to see how interview look "on screen." Very pretty! Maria, we haven't met or exchanged words. If TheHappyNappyBookseller interviews are recorded and need transcribing, I can help. Do you know the benefits of having transcripts available? For the second book prize - I would love to give this to my niece Becca, who is 15. Hmm what am I willing to share. My days of eating a pint of ice cream in one sitting are over. I loved those days.